If you have celiac disease, consumption of gluten (a protein found in seemingly wholesome foods such as wheat, barley, or rye) can result in an allergic reaction that damages the lining of your intestines and prevents the absorption of important nutrients. It can also cause symptoms such as bloating, gas, constipation, diarrhea, lethargy, and nutritional deficiencies. The only treatment that exists today for celiac disease is a lifelong gluten-free diet. Products that contain gluten include most breads, cereals, crackers, and processed foods. For many people going gluten free may involve a complete overhaul of their diets, but persistence in avoiding gluten will result in stoppage of symptoms and healing of the damage to the intestines. Celiac disease is becoming more common. According to research statistics, the incidence of celiac disease has increased from 1 in 10,000 people to about 1 in 130 people in the last 2 decades. Celiac disease and gluten sensitivity are not the same. Although people suffering from gluten sensitivity may have symptoms that are similar to celiac disease such as bloating & gas, a unique feature of celiac disease is it causes the immune system to attack the small intestine interfering with the absorption of vital nutrients, minerals, and vitamins. Symptoms of celiac disease vary from person to person. In addition to the bowel problems that occur after consuming foods containing gluten, impaired absorption of nutrients can result in unexplained anemia, weakness, depression, and fertility issues. In 50% of the cases, there may be no obvious warning signs & symptoms of the disease. Diagnosing celiac disease can be difficult. 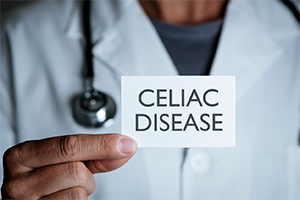 As symptoms of celiac disease are varied and mirror other conditions such as IBS (irritable bowel disease) or Crohn’s, establishing a diagnosis may require a complete physical examination, blood testing, and obtaining a biopsy of the small intestine. The specialists at North Central Surgical Center can evaluate your symptoms to accurately diagnose you condition and formulate a personalized treatment plan to put you on the path to a speedy recovery.